December 31, 2010 Angela G.
From an early age, I’ve been a sucker for blubbery noodles in chicken soup. Doughy and dumpling-esque, these treats could be a meal of their own, languishing in a bath of shredded chicken, carrots, celery and light broth. We used to go to this restaurant in the mall near our house that was an all-you-can-eat soup and salad buffet. The main draw for me was always the chicken soup, and I cursed the little crocks there to use for the soup because they just couldn’t contain all the noodle majesty that I was looking for. Years later, a trip to the substandard Sweet Tomatoes (I know, I should have known) brought back memories of my earlier favorite. They make a Chicken Noodle that brags about just being chicken and noodles, which would be fine if the soup weren’t flavorless. And yet, it comes so close to awesomeness with their perfectly doughy, homemade noodles. I actually had my husband get me two takeout containers of the stuff and scoop out mostly noodles, bring it home and add it to homemade broth of carrots, onions, celery and parsley. Divine! But not worth setting foot in a Sweet Tomatoes. Why couldn’t I make these wondrous babies at home? Well, after a little research on the web and a little inspiration from For the Love of Cooking, I was able to recreate happiness in a pot. I’ve officially had my cake and eaten it too. If by cake, we’re talking about a big ol’ bowl of chicken noodle soup. In a standing mixer, add egg, milk, salt and pepper. Mix until blended and then add flour. Mix on low to medium setting until a dough is formed and a ball gathers around the bowl. Remove dough from the mixer and knead a bit on a flat surface to gather up dough – very briefly, only about 30 seconds. Wrap dough in plastic wrap and refrigerate for 30 minutes. Cut the dough into three portions. Using a pasta roller (or for me, the pasta attachment for my Kitchenaid) roll out the dough on the widest setting until silken and 1/8 of an inch thick. Move dough to a sheet of wax paper and cut into strips with a cookie cutter. Know that your noodles will double in size once cooked, so for blubbery ones like I like, I cut them into 1/4 in. by 2 in. lengths, for 1/2 in. by 4 in. noodles once cooked. Let noodles rest on the wax paper for an hour or so (you can let them hang out while you tend to your soup) to dry a bit. 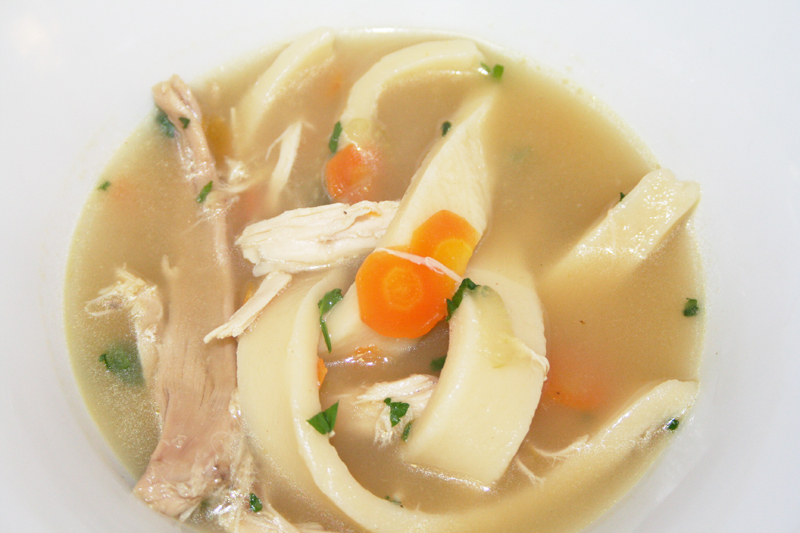 Make a pot of chicken soup by either following this recipe for homemade chicken soup or by warming 4 quarts of chicken stock with 2 finely sliced carrots, 2 finely sliced celery stalks and a few fresh bay leaves. Shred the meat from a store-bought rotisserie chicken and add to the soup. Drop the noodles into a pot of hot broth and cook until tender all the way through, about 45 minutes. If you’ve cut your noodles thinner, they will cook faster. I sometimes cook the noodles up to an hour to get them super tender like dumplings. The longer you cook, the more broth that is absorbed and the more tender your noodles.